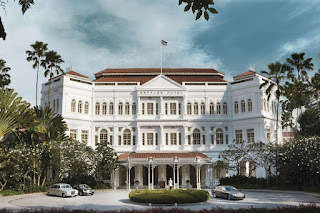 The iconic Raffles Hotel in Singapore, South East Asia is receiving a major face lift. After nearly 30 years the 130-year old property is working on several renovations to the existing hotel as well as the addition of new buildings. The hotel has a ton of history behind it! This famous hotel is the home of the Long Bar, a “place to be and be seen” among tourists and former patrons like Ernest Hemingway who would eat and drink at Raffles. Also, the bar and billiard room was the place where the fabled last tiger in Singapore was shot and killed. Learn more the RafflesSingapore fable. The hotel is not only famous for past events, but modern-day events such as the upcoming blockbuster movie, Crazy Rich Asians which the hotel was featured in. The hotel was being revamped not only for the filming but also the residency of several world-renowned chefs on the property. The hotel will now cater to modern travellers, but showcase the strong history of the hotel and what has made them famous. The key to the renovation was update and expand the footprint but at the same time restoring some of the historic original features. We’re proud to say that not only were LATICRETE products used on the current renovation, but the previous one done back in the 1980’s (costing $280 million)! Learn more about the RafflesHotel renovation.